As a manufacturer of health technology equipment, products and systems, medical device prototyping is fundamental to your medical product design and development process. Creating early samples of your health technology products gives you the opportunity to test and evaluate the concept and work on further improvement. Do you have questions about product design and are you unsure how to resolve them? Are you looking for a party that collaborates with you on medical device prototypes? Even if you don’t have a detailed plan yet and are still working from a rough idea, you are at the right address for prototyping consulting. 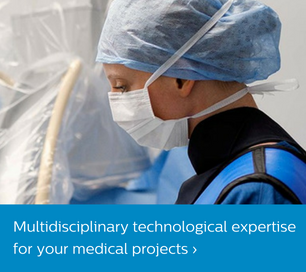 Get Philips Innovation Services on board to support your medical device prototyping process. We can help you test and validate concepts by developing functional models and prototypes that will accelerate the process of turning innovative ideas into market-ready products. With Philips Innovation Services working closely with you, you’ll benefit from a fast response, a broad skill set and hands-on experience in the healthcare domain. 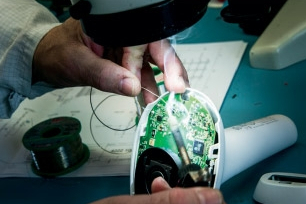 We carry out fast prototyping for health technology under one roof. Through a single point-of-contact, you gain quick access to a wide range of product development competencies. The prototyping service from Philips Innovation Services delivers prototypes with essential functions for concept and market testing of health technology products fast. This enables you to explore ideas, generate early customer feedback and develop a fit-for-purpose solution. You can evaluate study models to authenticate specifications, fine-tune designs and make informed decisions at critical process milestones. You also gain valuable insight into development costs, timescale and resource requirements. Philips Innovation Services helps you to meet technical and regulatory challenges in the medical sector. Sound interesting? Contact Ronald Soupart, one of our experts, right away! Our approach to medical device prototyping helps you move from an initial idea to a realistic plan. Detailed knowledge of medical certification is embedded in our organization, making it easier for you to feel confident about compliance at a later stage in the product development process. We can complement your knowledge with our expertise in this field, while our lean way of working means that your prototypes will be on time and on budget. Prototyping helps you get from A to B with a high degree of flexibility and make the necessary adjustments along the product development route. Fast prototyping stands out in terms of innovative thinking and proactivity. We translate ideas into prototypes for the medical world. You can use our knowledge of this world and its specific requirements to make the right decisions early on and not be faced with any surprises at a later stage of your product design process. By listening to you, we filter the appropriate topics to optimize the process and help you optimize the final product. We are solution oriented, pragmatic and flexible, and fully understand your prototyping challenge. If speed is critical – and in this dynamic industry it usually is – prototyping specialist Ronald Soupart can give you information about the availability of specific competencies and planning. When commencing a medical innovation, your focus is on finding your way to the market. But how to tackle technological challenges and prove the medical claim, while your project planning is stretching and medical regulations are non-negotiable?